Bass Bar installed and trimmed–F-holes refined. Edge-work begun. The Bass Bar is in place and trimmed. The F-holes have been refined, somewhat, and the edge-work is begun. Bass-bar was #1 on the list! 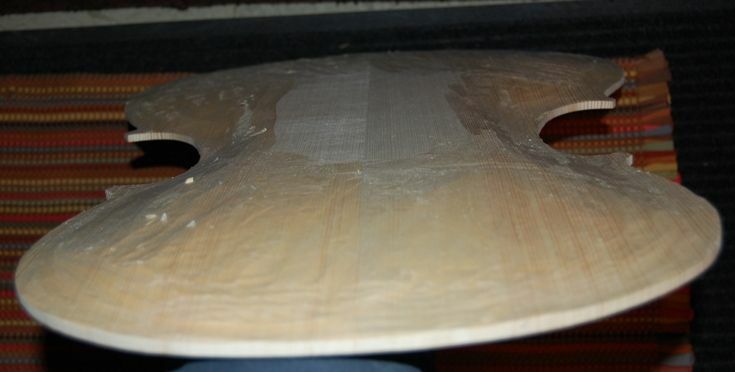 I installed the bass-bar first thing this morning (chalk-fit to the inside of the plate in the exact location it was to be glued, then glued with hot hide glue). Then, while the glue was drying, I went and did other things. Swept up the shop, changed the tires on my car (snow tires have to be off this weekend), and designed some display stands for the upcoming show at Marylhurst University. 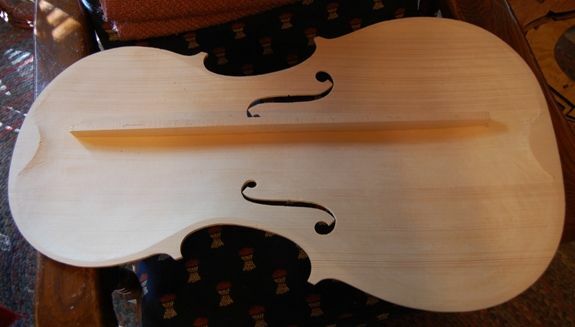 I had intended to begin the graduations on the one-piece cello back plate today, but after I did the tires, I was pretty worn-out, and hurting, so I decided it was time for a break, and, since the glue was dry, time to trim the bar. 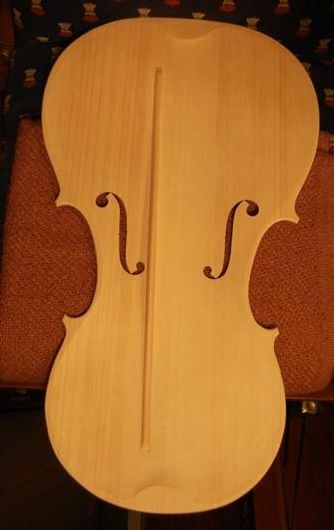 Cello Bass-bar in the rough, viewed from the side. Although you probably really can’t tell in the photos, I have also scraped the entire plate, inside and out, under low-angle light, to get every dip and hump as smooth as can be. Also, I began the edge-work; I first planed a small (3mm) bevel all the way around the inside edge, then rounded it with a file, to establish the inside curve of the edge. The outside will be treated the same way, after the plate is installed on the garland. 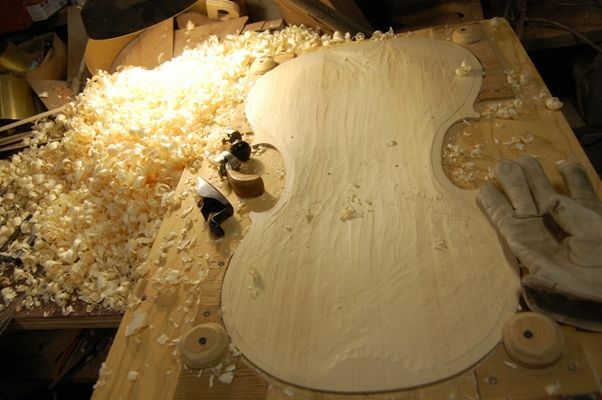 It is much easier to manipulate the plate by itself, instead of the whole cello, so I want to do as much as I can before it is assembled. 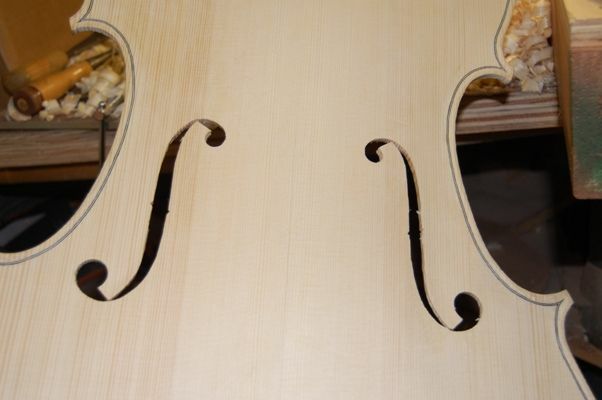 I also spent time refining the f-holes; smoothing the inner edges, matching bass to treble shape, etc. That, too, is much easier before the plate is assembled with the garland. Tomorrow I will try to graduate the back plate. 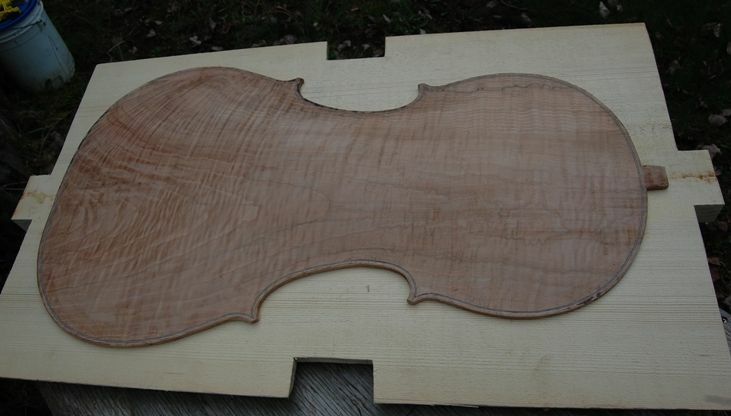 It took me a couple of hours, I guess, to do the final graduation, planing and scraping the inside of the European Spruce front cello plate to perfection (or nearly so). 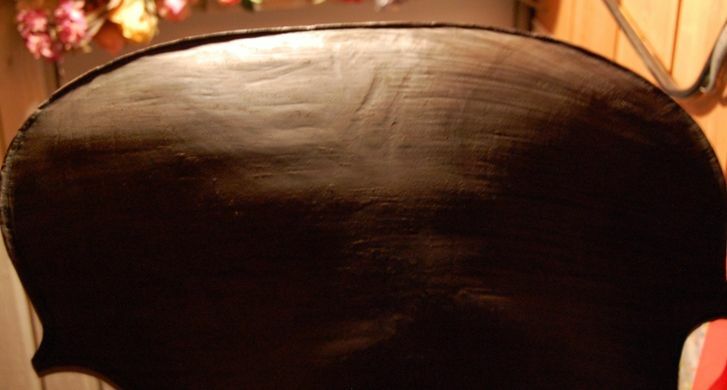 Here is the plate, with some pieces of willow lining stock across it, to form shadows so you can see the curves. The color is so neutral that without the shadows, the plate looks flat in photographs. The f-holes had been incised earlier, so all that was left to do is finish cutting them out. I used the f-hole cutter to cut the circular portions of each f-hole. Then I used a coping saw and a knife to complete the cutting. 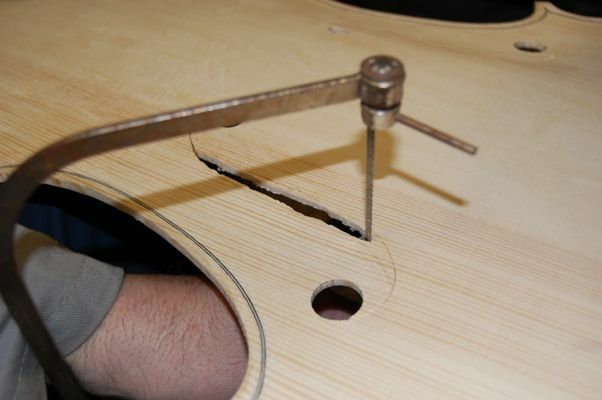 Each hole will still be refined and perfected, later, using a knife and a small file. 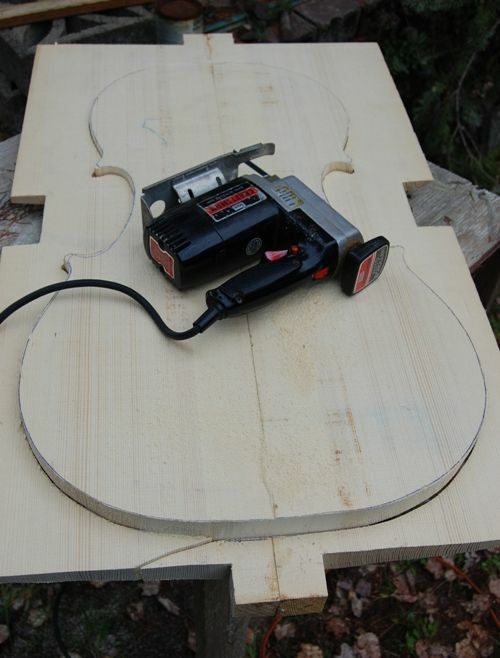 Cutting out the f-holes with a coping saw. 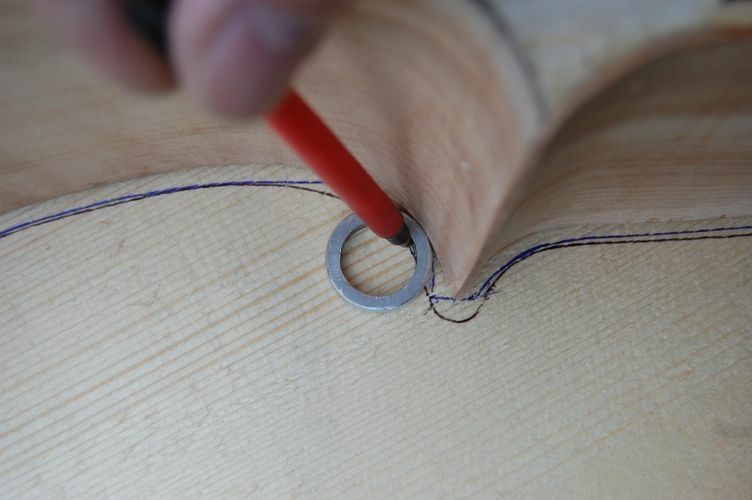 Finishing the F-hole shape with a knife. But the f-holes are essentially complete. the next step is to install the bass-bar. Completed f-holes, ready for refinement. Today I used low-angle light to reveal all the humps and hollows, and used scrapers to bring all of them to a smooth continuum of curving wood. Once I had the front plate fairly smooth, I laid out the f-holes, and incised them deeply. 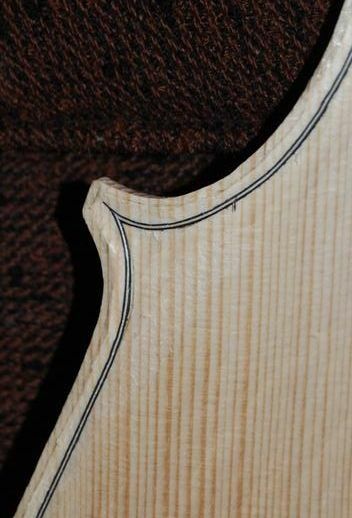 My reason for doing this is that every single instrument I have made, the arching proved to need correction, as revealed when I laid out the f-holes. 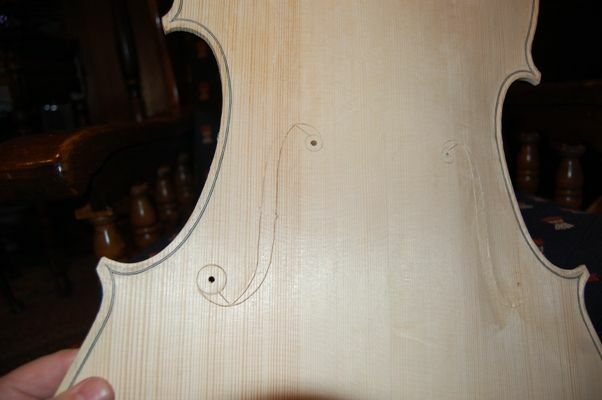 Invariably the arching was too “puffy” around the lower ends of the f-holes, so I had to re-carve that area. Finally it occurred to me that if I cut the lines in, they would remain visible as I carved, and I would not have to lay them out over again. That turned out to work pretty well, so now I routinely assume I will have to correct the arching, and I incise the f-holes, then view the plate from the side: what I am aiming for is that the general shape of the f-hole will seem to lie in a plane parallel to that of the ribs when the instrument is assembled, rather than describing a lazy “S” from the side. It is not something “exact”, but more of a general impression. One way or another, it allows me to see when my arching is not right, and correct it. So, here is the top plate with the f-holes incised. I will finish cutting them out after the inside carving (graduation) is nearly complete. 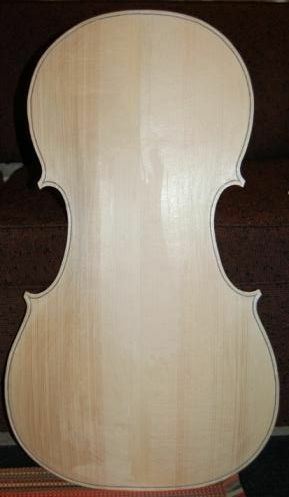 Annnd the back plate: (still may be a bit puffy in spots…I will work on it more later. Right now my hands are hurting from all the scraping) That’s all for today! I’m worn out. 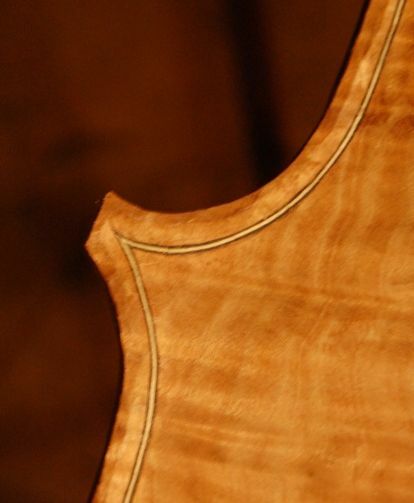 Here is the cello top, freshly purfled, hot hide-glue still wet. 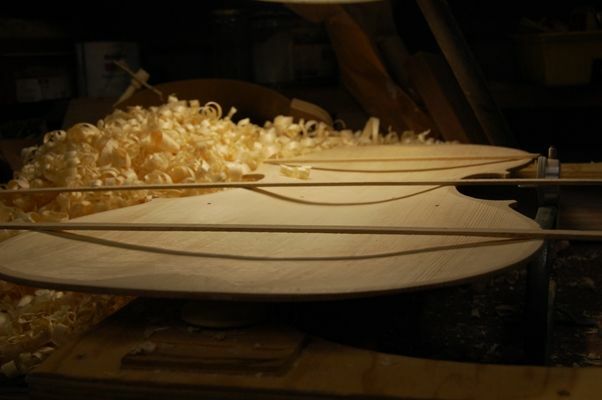 Tomorrow night I will try to complete the final arching and lay out the f-hole perimeters. I had some distractions tonight, but that is life. Life is what happens while you are trying to complete your projects and plans. Embrace it or fight it, that is simply how it is. This spruce has very pronounced winter grains, which were hard to cut smoothly for the purfling slot, but the plate rings like a big bell if you tap on it. 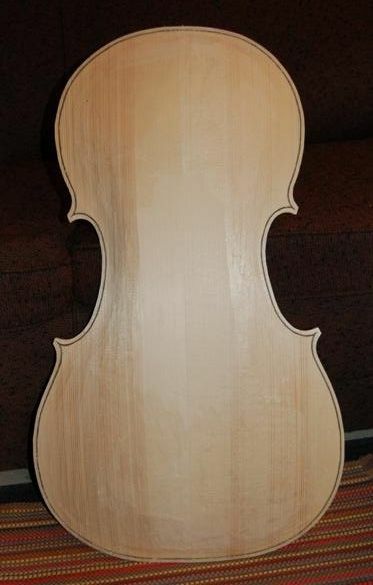 I think it will probably be a very good cello. 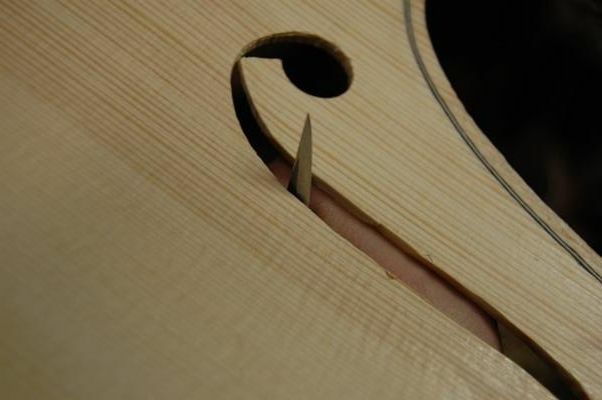 Anyway, tomorrow evening when the glue is dry, I will cut the channel and begin finalizing the arching. If I get it close, I will try to get the f-holes laid out and outlined. 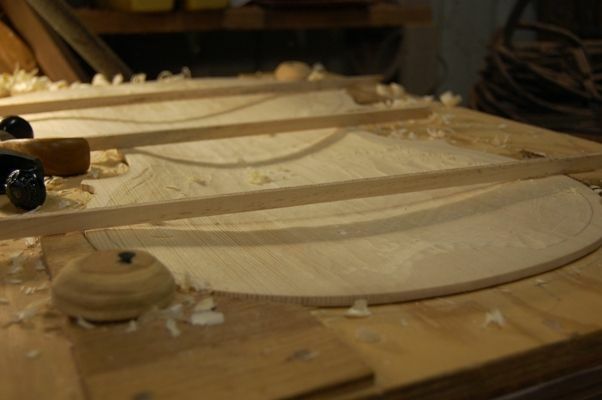 After that it will be time for graduation of the plate (carving the inside arching). 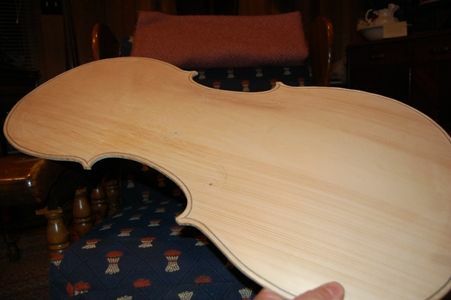 The Cello top is rough-arched, and ready to purfle. 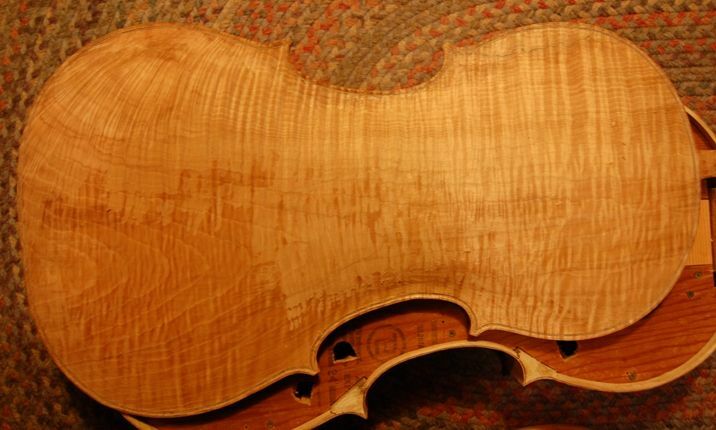 The European Spruce top, from International Violin Co., carves easily, but is quite crisp, too. I reduced the top to 24mm thick, using an abrasive planer, then reduced the edges to 5.5mm, using an Ibex plane, modified to take a wooden handle. 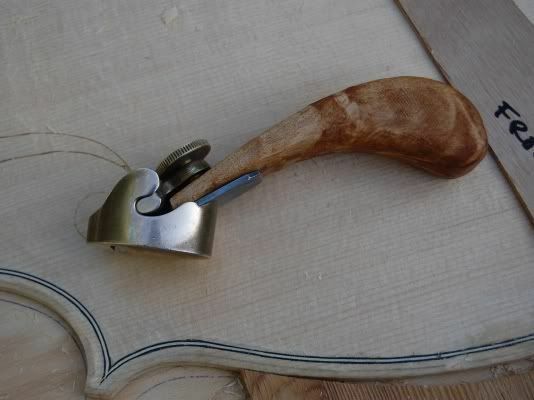 Modified Ibex plane with wooden handle. This tool allows me to apply much more force, and cut deeper, faster. 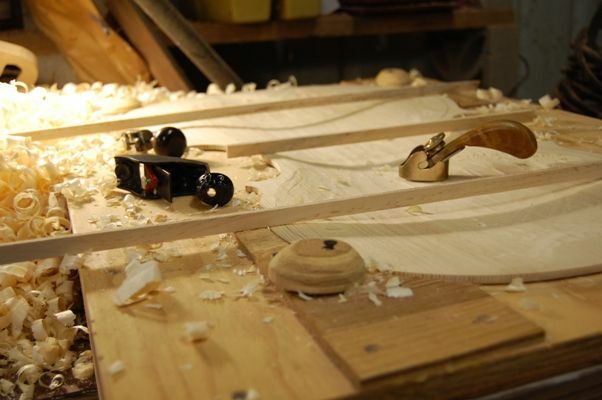 Sort of a “poor man’s scrub-plane”. Once the edges were close to the 5.5mm line, I switched to a 10mm Ibex plane and shaved the edges of the spruce right down to the line. 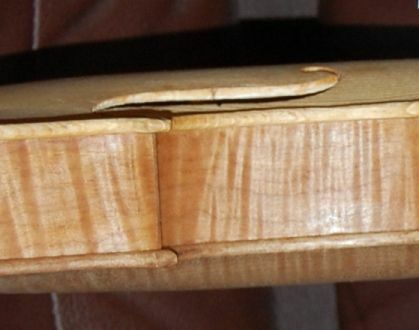 The edges are 5.5mm…the middle is 24mm. 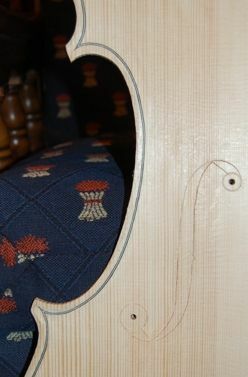 I will finish the arching after the purfling is complete. 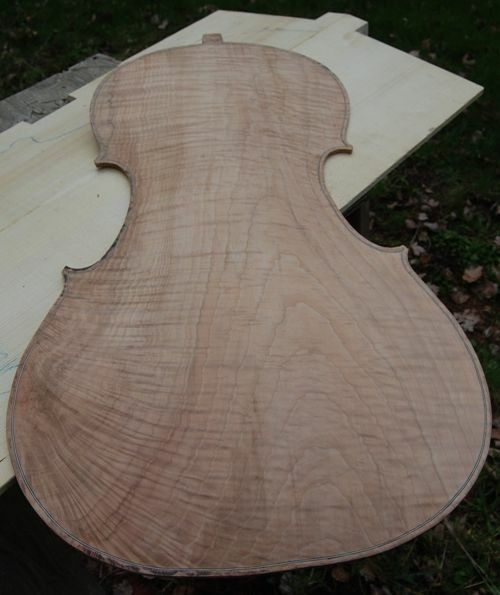 The cello top is ready for purfling. Tomorrow I will begin the purfling, and complete it on Friday, I hope. 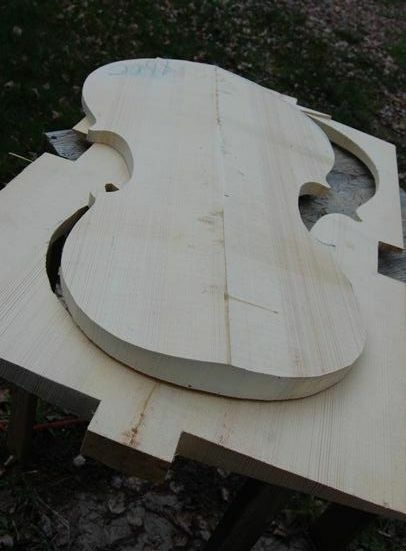 Then I can complete the arching, trace the f-holes, and start making this thing look like a cello. Pretty rough-looking, huh? But that low-angle light is what reveals the lumps so that they can be planed or scraped away. Some of those lumps are big enough that I intend to use a small plane to reduce them before scraping again. Saturday, I joined the top plate halves. 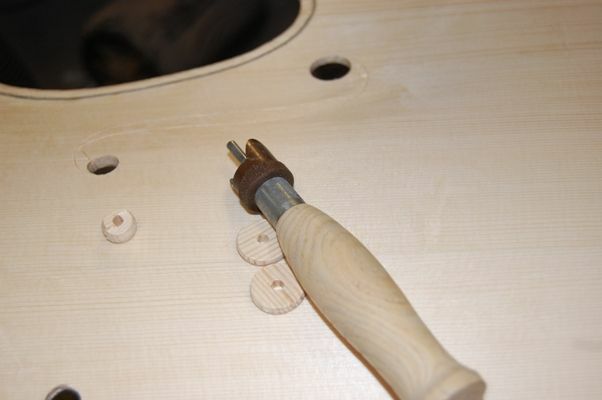 The notches in the ends and center were to accommodate clamps. I had worked the mating edges as smooth and flat as I could get them (it seemed perfect, but looks can be deceiving), and then heated the two surfaces with my heat gun until they were uncomfortably warm, slathered on the hot hide glue, and presented one half to the other, rubbing them under pressure, to get the glue to run out the edges. 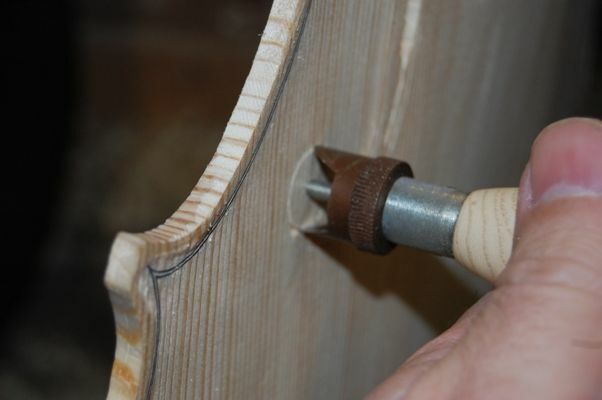 Then I clamped each end firmly, and finally applied two bar clamps in the center notches. I was fearful that the joint might not have been good, but today I took the clamps off and had a look. All is well! Here are the two plates (front and back) together. Notice how much nicer the back plate looks in normal light? That is why you never trust the looks of the arching until you have checked under low-angle light. Using a slice of aluminum pipe and a ball-point pen to trace the shape of the front plate from the garland. So I re-traced in black ink, directly off the front side of the garland, using the section of aluminum pipe to maintain the overhang distance. See the difference? 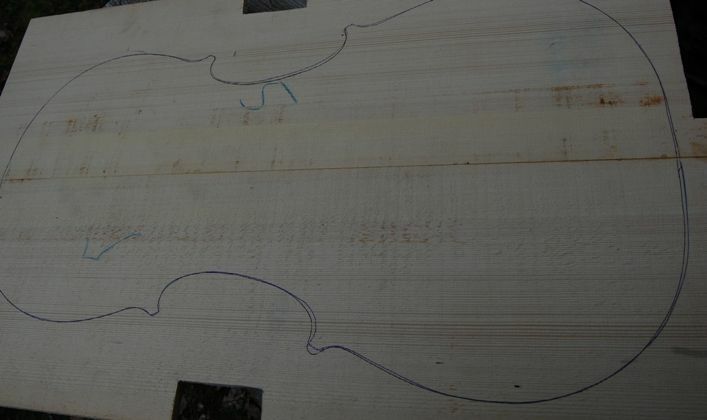 Blue line is traced from the back–black is from the front of the garland. So, I cut the plate out on the black line, leaving the corners just a little long, so I could work on them more carefully, later. Here is the result.